Frankliniella occidentalis – known as Western Flower Thrips or Californian Thrips, is a small insect originating on the West Coast of North America, which spread through much of Europe in the 1980’s as a consequence of the international trade in plants. It is now established as a major pest in most parts of the world. 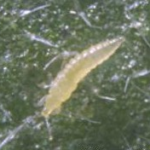 Adult thrips have delicate, hair-fringed wings that allow them to move into and through crops. Western Flower Thrips adults are attracted by flower odours. 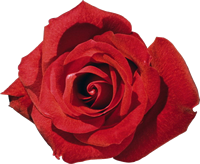 Once in flowers, they feed on pollen and on developing petals, causing blemishes that reduce the value of cut flowers. Some flower varieties and colours are more prone to damage than others. Eggs are generally laid in leaf tissue or developing fruit, and can cause small, hard, ‘warts’. Feeding on developing fruit also causes damage, typically seen as a roughening and hardening of the surface. In sweet peppers this generally shows as a ‘corkiness’ of the surface, whilst in strawberries the affected areas fail to develop, and can appear golden: the fruit becomes distorted, and market value is reduced. Larvae are small, usually orange in colour, and have only two feeding stages before dropping to the ground. In the upper layers of the soil they form a non-feeding pre-pupa, then a pupa, and it his stage they are vulnerable to some soil dwelling predators. Some pupation can also occur amongst foliage. Frankliniella occidentalis is also responsible for transmission of numerous virus diseases to plants, the most important of which are protected crops are Tomato Spotted Wilt Virus (TSWV) and Impatiens Necrotic Spot Virus (INSV), both affecting peppers and a wide range of ornamental crops. Virus diseases are generally acquired by first instar larvae feeding on infected leaf tissue. These larvae are unable to transmit the virus until they become adults. 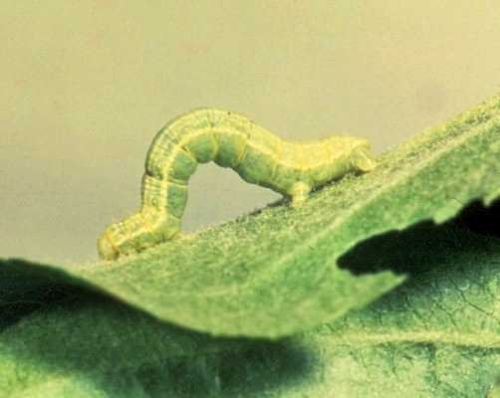 Later larval stages and adults are unable to acquire the virus, but infected adults can transmit virus to fresh, uninfected plants, thus spreading the disease from plant to plant within the crop, and into new crops. Hypoaspis miles offers some additional control as part of a programme with other control agents, but does not give adequate control if used alone. 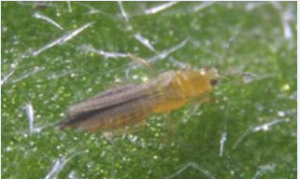 Thripline ams: To improve the control of Western Flower Thrip an “Advanced Monitoring” System” called Thripline has been developed by Syngenta Bioline in collaboration with Keele University to improve timing of control measures by improved pest monitoring.